Nafpaktos, which should surely merit an entry in the dictionary of places with silly names, even gets a positive write up in my guide book. The harbour is a delight and from my vantage point here in the square I can see the sprawling Venetian castle dating from the15th century. It’s nice to see something historic that isn’t referred to as ‘ancient’. I don’t have the inclination to push a fully-laden bike up the hill to explore it in more detail but it look very pretty from down here. The town is also very cycle-friendly. It has cycle routes, signage and even a bike sharing scheme. Just a pity that as I tried to cycle along the main street earlier, many residents had interpreted the markings on the cycle lanes & signage as a licence to park their cars in them. Mmm… I pinged my loud bell at each one of them in disgust. Bearing in mind the use of the horn here in Greece however, I suspect the point was lost upon them. Before leaving the hotel – cracking all-you-can-eat breakfast by the way – I studied the map while strolling half naked on the balcony. Too much information? You didn’t need to know where I was did you? I’ve decided upon a route towards Albania that will keep me close, mostly very close, to the coast. There is a campsite marked on the map at a place called Mitikas. I couldn’t find a reference to it on Google however (there is another place called Mitikas over in the east with a campsite) so I’ll just have to hope. The town does also have hotels. Slightly further north is Paleros. 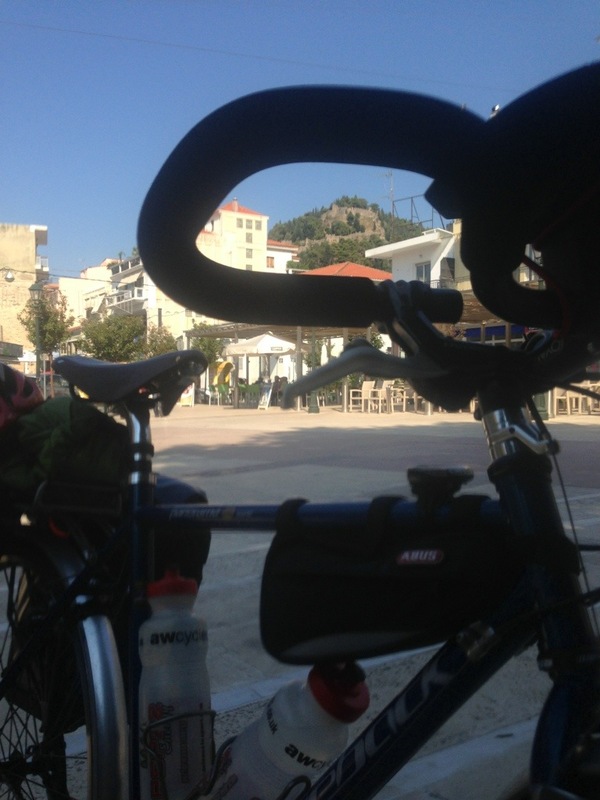 Ed Cox who is cycling from Bristol to Brisbane did pass on a contact in Paleros but I haven’t heard anything from him. I wonder where Ed currently is as he said he might be in the area around the 7th. Today is the 8th I think. I’ll look out for him as I cycle. Lots of today’s route is lined in green which on a Michelin map means ‘scenic route’. After yesterday’s drab relentless trapse from Olympia to Patra I am hopeful of something more pleasant on the eyes although that does usually mean that it is more strenuous on the legs. So, while you’re contemplating my toned calf and thigh muscles here’s an arty picture of Reggie and the castle in Nafpaktos. Thank goodness for the coffee and tea drinkers. Without them – whoever they are and why ever they are – we wouldn’t have any cafes. Without cafes it might not be worth cycling across Europe. Long live the cafe customers. I was reading your story and I was enjoying it very much but now I have to tell you that I am sad to see that you are the victim of the anti-Greek propaganda. Greeks sitting in the coffee is a result of the troika that has put out of work thousands of Greeks and is DESTROYING this beautiful country . You I believe are a teacher so you must know the value of the public service which this fascist government with the troika wish to crush. Greeks are working hard despite this oppression and they are industrious just as the Germans, perhaps more from them. I am sorry for me in the public service, my friends, above all for Greece for also for you because obviously you are victim too of this propaganda. But now I have said this, I wish you good luck, I will continue to read your story to the end and you have my support. Coffee drinking not unique to Greece, whatever the economic situation. I still wonder at the French and their early morning coffee habits often accompanied by a beer or glass of wine at 9am +. Not knocking it, but like Andrew, I constantly wondered what job they did and what was that all about? Wish we were a bit more chilled in the UK. Thanks for that. It’s good to have a Greek view if things! !